Our application for iGEM is sent. A team of four master students (Bram Danneels, Griet De Clercq, Wouter Steyaert and Chari Vandenbussche) is assembled under guidance of PI Wim. March 03: We start brainstorming for subjects. March 24: PI's Marjan and Yves join the team. April 22: Three subjects are chosen, and we start preparing a presentaion about them. May 03: Our iGEM application is officially accepted. May 04: Presentation of our possible subjects for PI Wim and our fellow sudents. May 06: Our team grows, with six phd-students and one adivsor joining. May 17: We sit together for the first time and discuss the different subjects. May 31: We chose our subject! The work gets divided into four work packages, and we divide the work. June 15: Fablab was contacted to be a partner for our 3D-printing needs, and they gladly accepted. 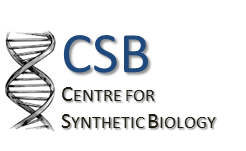 June 29: We write an abstract on our project, and submit it to our iGEM wiki. Our Facebook and Twitter pages are live. A first draft of a 'sponsor letter' is made. July 18: We booked our stay in Boston. 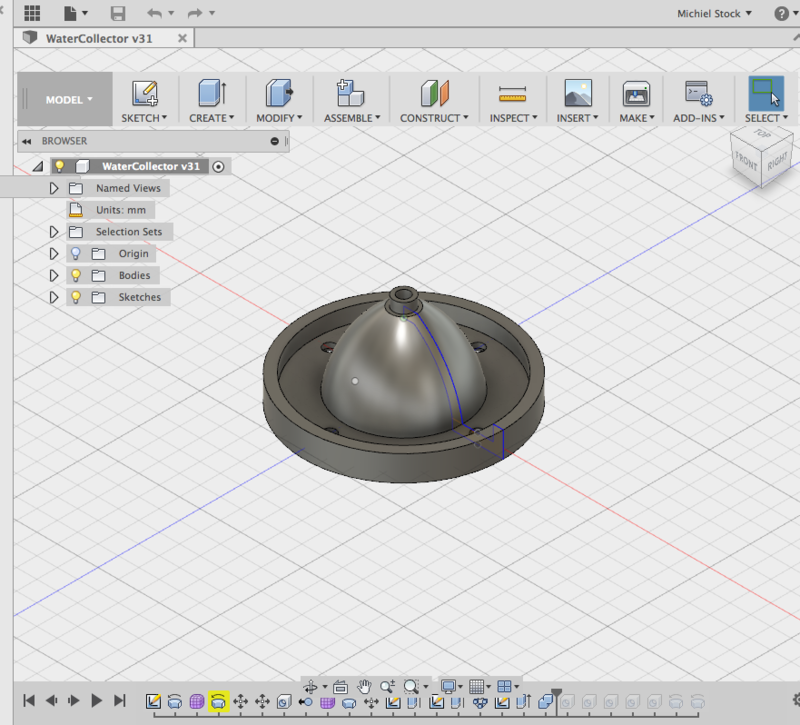 July 19: The 'shape' work package decides to use Autodesk Fusion 360 to shape the water collector. July 22: Prof Dan Fernandez (CSUMB), who performs research on fog catchers, is interested to with us. 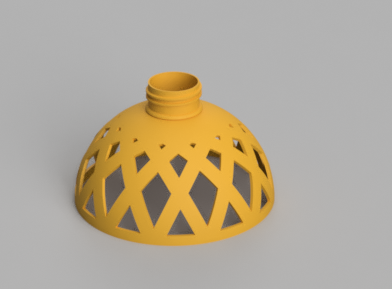 August 01: Our first 3D model of the water collector prototype is ready and printed: a dome with a gutter to collect the water. 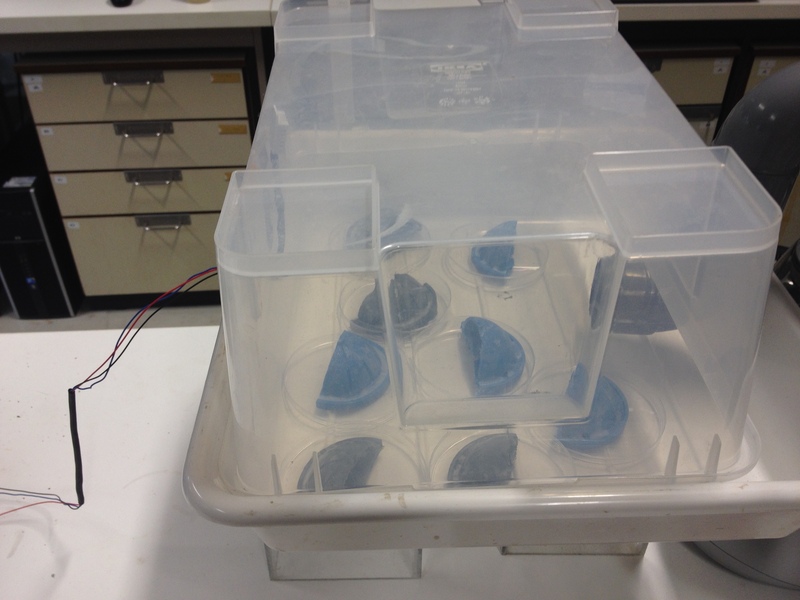 August 04: We optimized our water collector shape with holes to distribute the water. August 15: We created an informational video, showing what our project is about. August 19: We successfully dissolved 0.55g PLA in 8ml DMF at 80-90 °C (68.75 g/L) and precipitated it by pouring the solution into room temperature EtOH (disolol, denatured). August 20: The filament was precipitated and washed with ethanol (cf. 19/09). 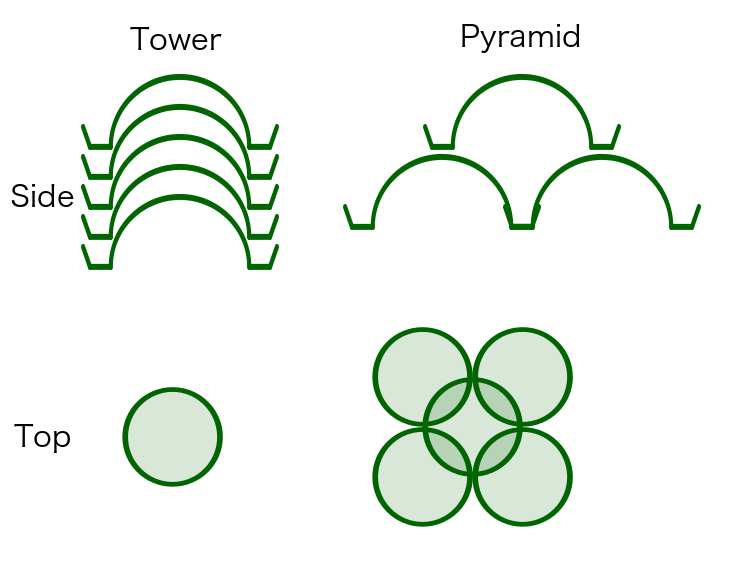 August 22: We brainstormed about the possibility to stack our collector, but unfortunatly this is not geometrically feasible. August 30: We brainstorm on other ways to combine our collectors. Meanwhile, we redsign the collector with only holes in the bottom ridge, and on the top. Also, the inside of the collector is made hollow. The first batch of biotin is delivered: the work on the filament can begin! 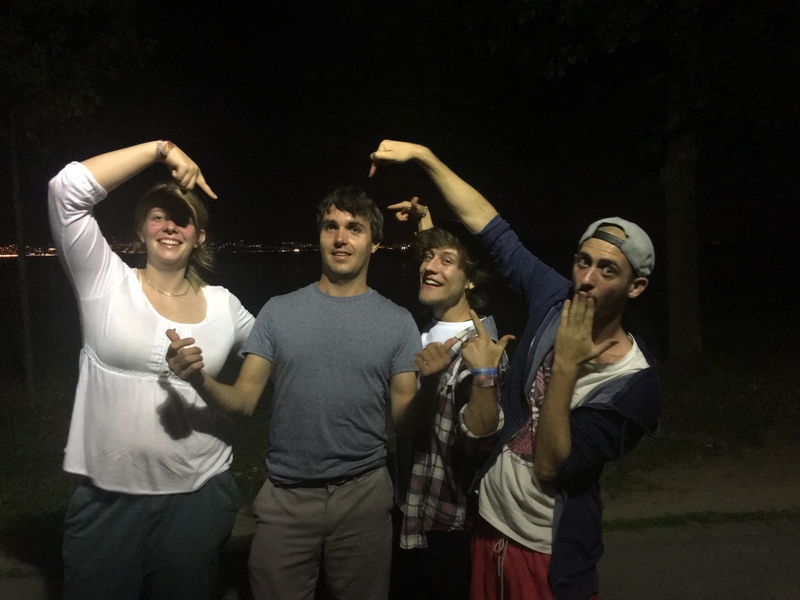 Steven, our advisor, met up with the EPFL team in Lausanne, Switzerland. They immediately bonded over a barbecue. 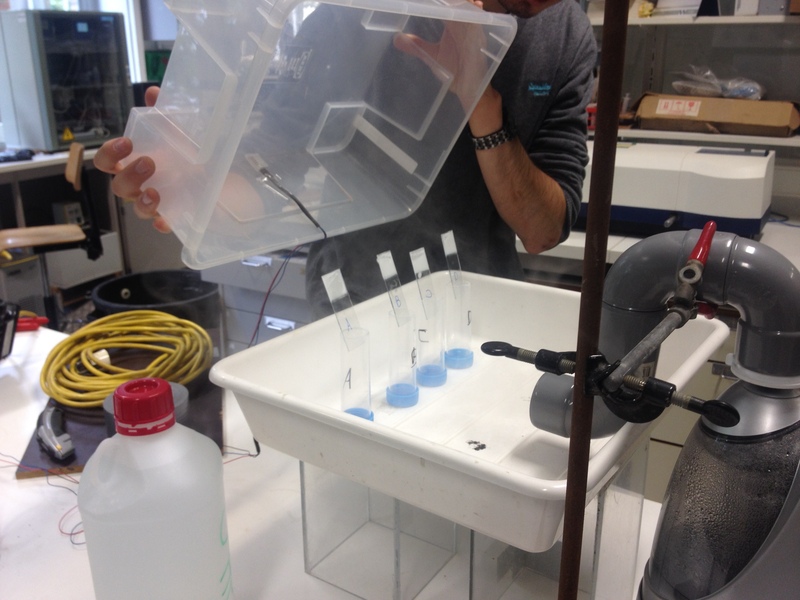 September 12: We performed some solubility and precipitation tests on the biotin and determine the optimal precipitation solution composition. 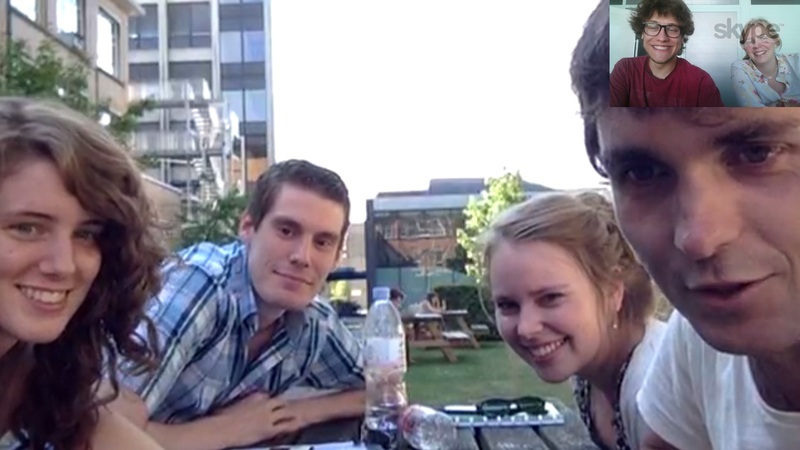 We all got to know the EPFL team better, as they conducted a Skype interview with us. Dewpal has been chosen as name! 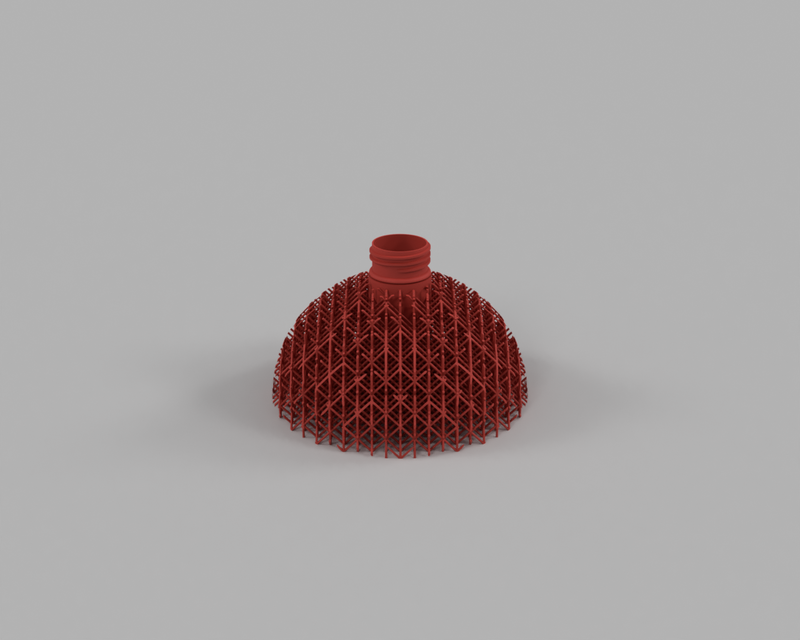 We came up with yet another design, now with internal water distribution. 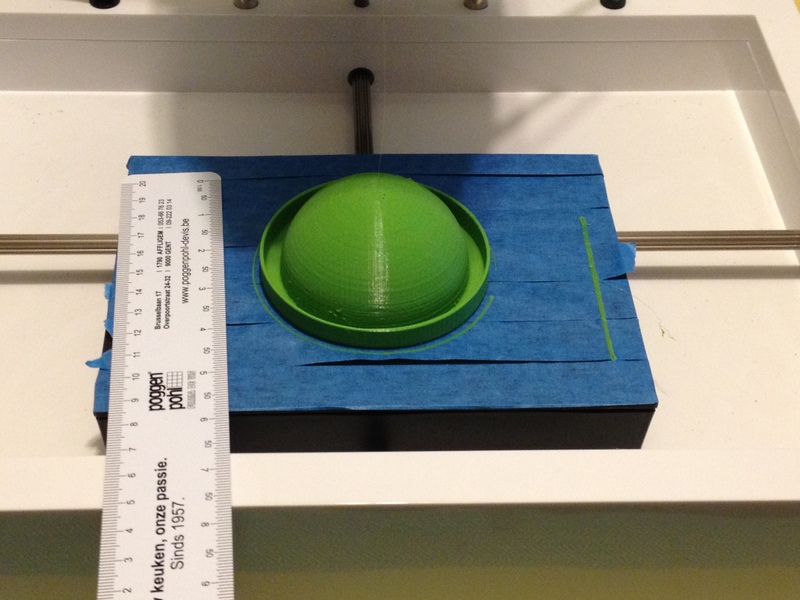 We printed three different prototypes of our water collector. We scaled the filament up 10 times. A slight raise in temperature was necessary to dissolve the PLA (145°C instead of 130°C on plate). When precipitating in ethanol, a rather glutinous substance was received on top of some big flakes that could be recovered. Our crowdfunding page is live! The filament sample (cf. 14/09) was decanted and centrifuged. PLA-biotin was harvested (pellet) and set to dry at 70°C overnight. 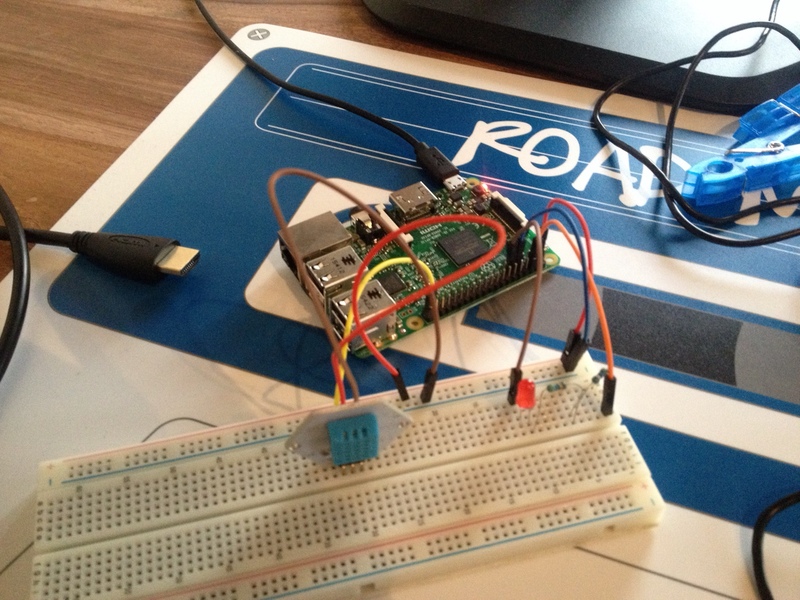 September 18: We made a temperature and humidity sensor with Raspberry Pi so we can observe the environment while testing our 3D shape. 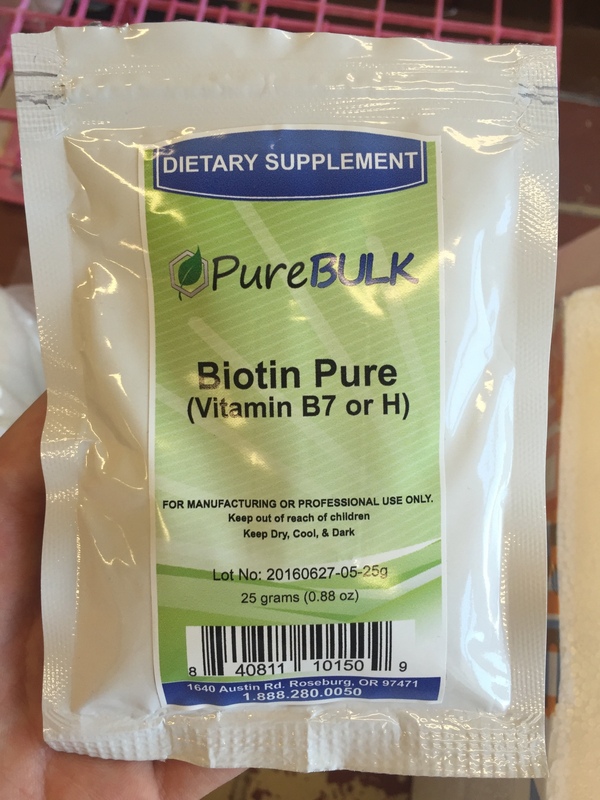 September 20: The water collector without biotin was tested for its water collecting efficiency. September 21: We met with Winnie from ReaGent. We met with Deepak from 3dee, who gave us some amazing advice on how to enhance our 3D shape. 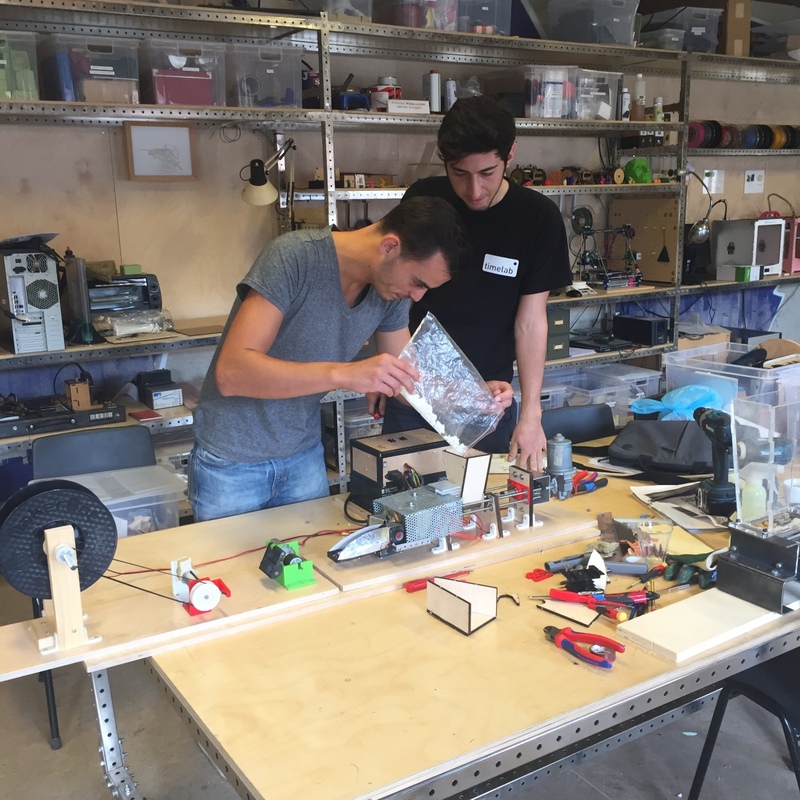 Our filament group went to Timelab to make a batch of filament using their extruder. 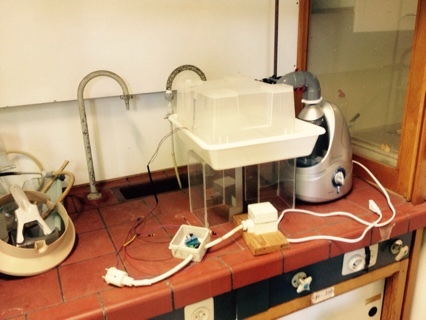 September 24: We made an experimental set-up with a humidifier and temperature/humidity sensor (cf. 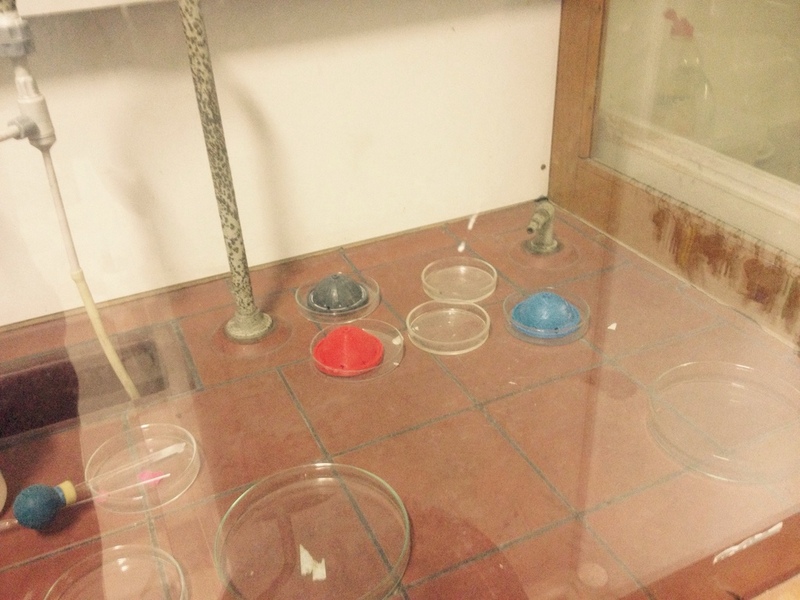 15/09) to test the water collection of our shapes. September 26: We tried our INP, and it works! 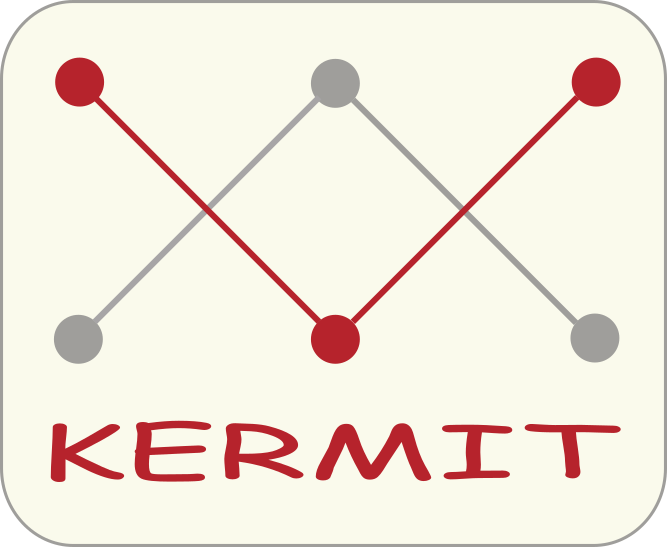 September 29: Our logo was designed. 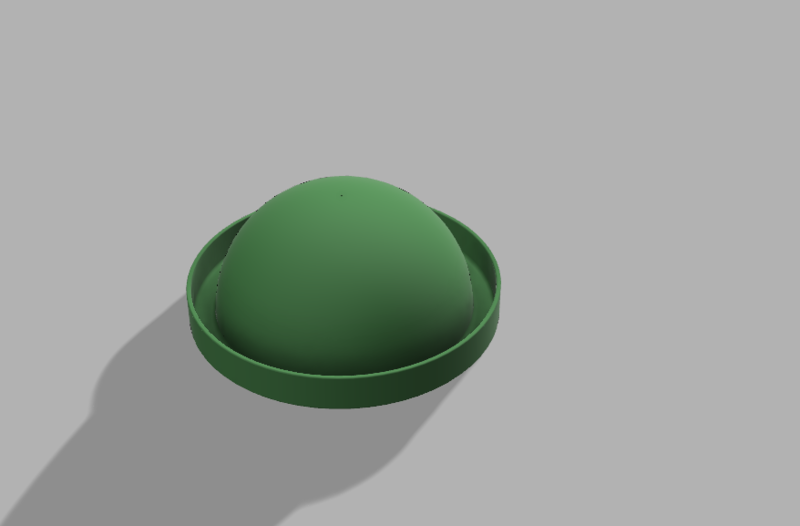 Our shape design now includes a screw cap to fit the collectors on each other, and on a plastic bottle. October 01: We improved the design of our shape again, now with an active surface area that is almost 20 times larger than the previous version. October 02: Yet another change in our design: now with weaving ribbons. October 07: 3Ders published a press article on our project. October 09: We started coating the water collector with biotin. 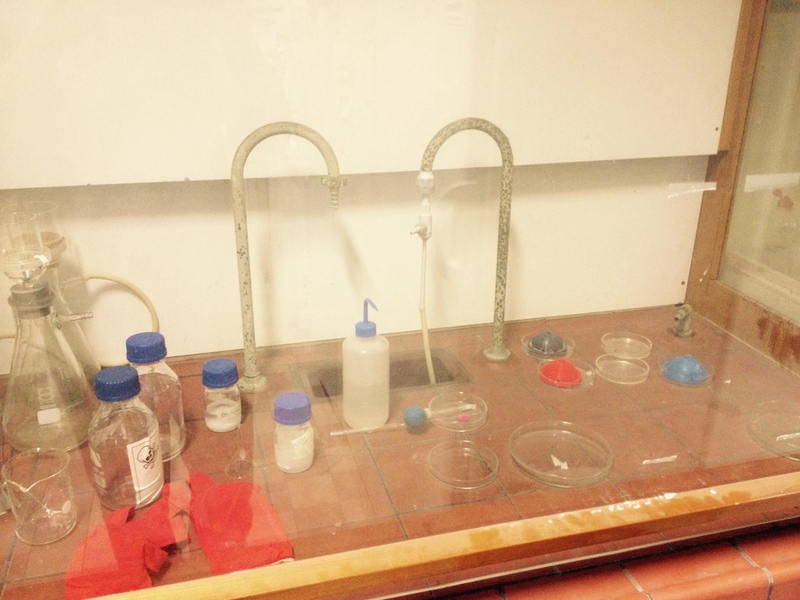 Solvent with PLA and biotin is poured over the water collector and left to dry under the laminar air cabinet. October 10: Digital Trends published a press article about our project. October 12: Testing four water collectors with four treatments: INP + INP_NC-mSA2, RFP + INP_NC-mSA2, INP_RC-mSA2 and mGFPuv2-mSA2. Each collector is sawn in half, one half receives a treatment and the other half is the control. The water collectors are placed overnight in the controlled humidified chamber. October 13: Another press article, this time by Made in Oost-Vlaanderen. The Chinese press also did an article on our project! Measuring the amount of water that was collected on our collectors. 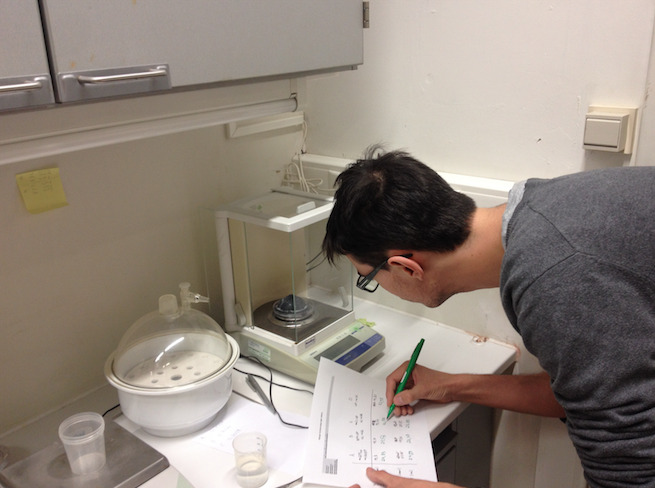 Running the proof-of-concept experiments with the microscopic slides. Measuring the amount of water that was collected on the microscopic slides. Working hard on the deadline for wiki freeze. National television picked up on our project. In the video, you see our translation of the Dutch video. October 26: We're off to Boston!